Find the perfect tensile fabric for your next project through Architizer’s new community marketplace for building-products: Click here for more information. 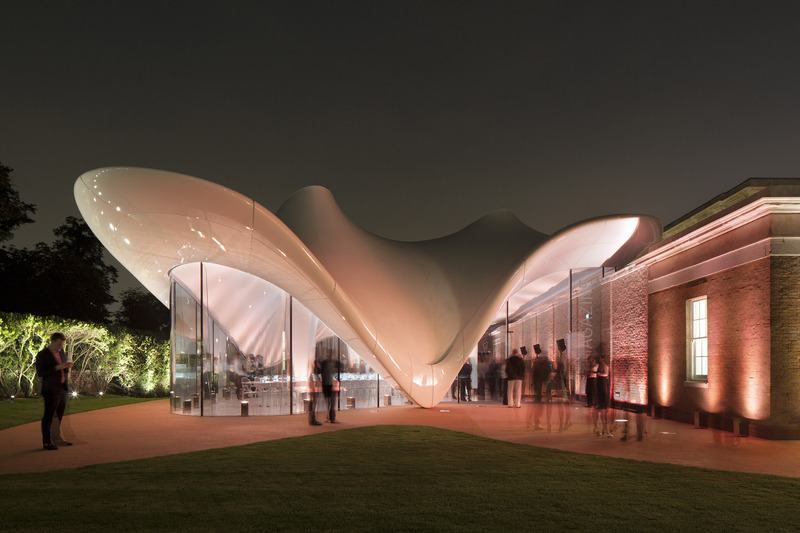 Are you a tensile fabric manufacturer looking to connect with architects? Click here. Since the initial invention of tents, things have come a long way. With the rigorous work and analysis of architects like Frei Otto, who was “obsessed with tensile structures,” along with steady technological progress, it has become much easier to create all sorts of ingenious fabric geometries. In turn, large-scale tensile structures have increasing in both popularity and complexity over the past few decades. A tensile fabric structure is characterized by the tensioning of a fabric membrane system, using cables, wires, steel or any other form of support system. By tensioning the fabric, not only are creases eliminated, creating a clean appearance, but the material is also fortified to withstand weather conditions or potential damage. While endless dramatic shapes are possible, many tensile fabrics structures are derivations of two shapes: the saddle and the cone. The saddle is a hyperbolic paraboloid, which means that the fabric surface is characterized by two high peaks and to low points; in other words, the saddle can be conceptualized as a warped rectangular grid. The cone resembles a volcano and is characterized by stacked radians or hoops. Today’s innovative tensile fabrics can be broadly categorized into coated and mesh fabrics. Coated tensile fabrics are made with a woven cloth fabrics that are stabilized with a protective a coating in all directions. These fabrics are typically for external use, and are therefore the focus of this article’s exploration. While mesh fabrics are also a type of coated cloth, there are small spaces between the thread bundles and are thus more common among interior sun-shading applications. Two of the most common coated fabrics are Poly Vinyl Chloride (PVC) coated polyester and Poly Tetra Fluro Ethlene (PTFE) coated glass cloth. PVC Coated Polyester: PVC coated polyester can be a great material choice for both permanent and temporary tensile fabric structures. PVC coated polyester is known for its excellent strength, flexibility, translucency and affordability compared to PTFE coated glass cloth and ETFE. The PVC coating, which is applied to polyester includes UV stabilizers, fire retardant additives, and anti-fungicides. PVC coated polyester fabrics have a structural lifespan greater than 20 years. However, you may begin to experience some visual inconsistency earlier than 20 years because the surface grows harder to clean with time. For this reason, manufacturers may only quote a lifespan of 10-15 years. Despite PVC’s durability and low-price, unlike many other polymers PVC contains chlorine, which has proven negative health effects on humans. Its chemical additives can also have a very negative effect on the recycling process of PVC materials. For this reason, architects such as Perkins+Will as well as leading material rating systems such as Cradle to Cradle and Living Building Challenge suggest that the only way to avoid the health hazards associated with PVC, is to eliminate it altogether. PTFE Coated Glass Cloth: PTFE coated glass cloth was developed by DuPont in the 1960s and has been used to create tensile fabric structures since the early 1970s. Originally, the material had a lifespan of 25 years; however, this has already been exceeded, with present day expectations lying somewhere between 30 and 50 years. Today, it is considered to be the highest quality material for creating tensile fabric membranes and the best choice if you desire a long lifespan and low maintenance. One of the most remarkable qualities of PTFE is that it is actively bleached by UV light, which means that it is easy to maintain a crisp bright white appearance over the course of decades. This means that before installation, PTFE actually has an irregular off-white or slightly brown color, which results from the manufacturing and fabrication process. In addition, the coating resists the build up of environmental pollution and is naturally cleaned off by the rain. PTFE coated glass cloth is available in various strength ranges. Typically, thicker fabrics will have a greater tensile strength and a lower light transmission rate, while lighter grade fabrics will have a lower tensile strength but greater daylighting and illumination effects. ETFE: While ETFE is a film rather than a fabric, it is worth touching on because it is commonly used as an alternative to structural glass and is rapidly growing in its applications. ETFE is an excellent choice if thermal insulation is a priority of your project. For a deeper exploration of ETFE building membranes, check out Architizer’s article: Glow Up: 8 Project Capturing the Power of ETFE Plastic. Size: Tensile fabric can be manufactured in virtually any size and shape. When thinking about size, it is important to consider how fabrics will stretch when they are pulled to create tension. The size of each panel is typically derived from a computer generated model, which is then modified to account for the way fabric will change during installation. Color: When it comes to tensile fabrics, white is by far the industry standard. By using a light colored fabric, you can effectively reduce the amount of heat that is attracted to the building, making it a more sustainable choice. Additionally, when working with PTFE, white can be a beneficial choice performance-wise, since the material is naturally bleached by UV light. That being said, many manufacturers offer tensile fabrics in a wide variety of vibrant colors. Translucency: PVC coated polyester can be manufactured with varying levels of transparency and light transmission, ranging from very transparent to completely opaque. PTFE varies in translucency, with light transmission commonly ranging from 7% to 15%; the quality of light that is transmitted is color balanced, diffused and free of shadows and glare. In many cases, ETFE is very transparent and has an approximate light transmission of 85%. However, ETFE foil can be fritted similarly to laminated glass products, to allow for greater opacity. In general, translucent fabric membranes can be harnessed to softly diffuse light and create stunning naturally lit spaces. Thermal Performance: According to Architen Landrell, “Long gone are the days when fabric structures were only used in large unheated spaces.” Thermal, a fabric by Architen Landrell uses multiple layers to form an external envelope that can achieve U-Values up to 0.18 for virtually any building, overcoming the thermal limitations previously associated with tensile fabrics. Several other manufacturers use Aerogel — today’s highest performing thermal insulation — in order to increase the thermal insulation value of tensile fabric structures. In projects where thermal insulation is a core tenant of success, speak to your manufacturer early on about opportunities for insulated tensile fabrics. Acoustics: Similar to thermal insulation, tensile fabric structures are available with acoustical liners, that can effectively alter reverberation time and increase speech intelligibility within a space. Maintenance: Tensile fabric structures are lauded for their ease of maintenance. That said, many manufacturers, including Architen Landrell, recommend that fabric structures undergo an annual inspection, in order to ensure that every part is functioning properly. Rainwater: Tensile fabric structures should be designed to channel water to the perimeter, and run off naturally. Many manufacturers can also installed gutters, which will redirect any water to the ground and away from the structure. Snow: Snow loading can be a challenging aspect of tensile structure, as snow will not simply flow off the structure in the same way that water will. Some structures, which are prone to ponding harness integrated heating to melt any show that tries to settle in. Tensile structures are lightweight, strong, durable systems that offer architects formal flexibility in ways other building materials cannot. The most alluring qualities of fabric include the diffusion of light, acoustic dampening and the ability to span large areas uninterrupted. The following projects feature structural fabric spanning wall to wall as ceilings planes or forming three-dimensional sun shading façades. This series of translucent and opaque wrappers give shape to both building and landscape. Search for the perfect tensile fabric through Architizer’s new community marketplace for building-products. Click here to sign up now. Are you a tensile fabric manufacturer looking to connect with architects? Click here.